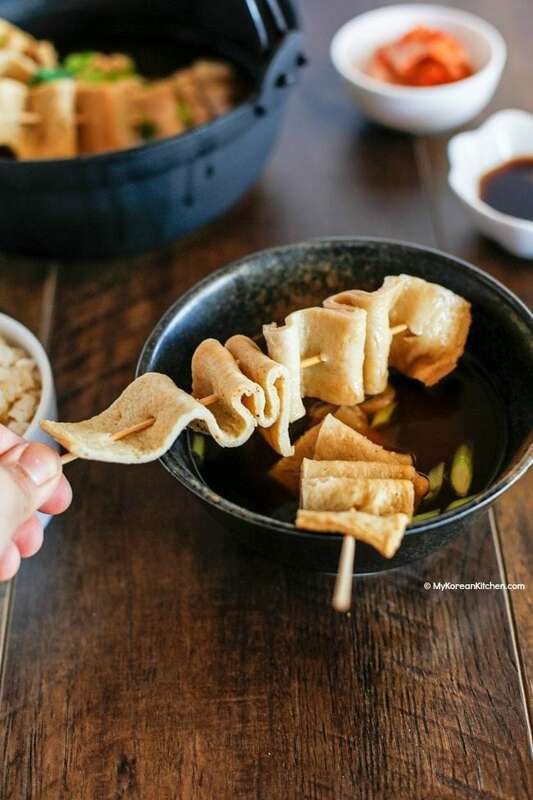 Learn how to make popular Korean fish cake soup at home. It’s refreshing, tasty and so comforting! As the weather gets colder, soup gains popularity as a side meal. This Korean fish cake soup (Eomuk-guk, 어묵국 or Odeng-guk, 오뎅국) is a perfect Korean comfort food. It is quite easy to make and also all the ingredients used are quite affordable. Maybe that’s why it is also a popular drink snack to accompany soju (소주) – a Korean distilled alcoholic drink. Korean fish cakes are called Odeng (오뎅) or Eomuk (어묵). Though Odeng is influenced by Oden from Japan. So in recent years, as part of a Korean language purification movement, the use of Eomuk is more encouraged. Typically Korean fish cakes are made with surimi, wheat flour, carrots, onion, salt, sugar and other additives. These ingredients are mixed, kneaded, shaped then boiled, steamed or fried. I don’t know about you, but in general, the perception is that packaged Korean fish cakes typically available from a Korean grocery stores are “not healthy”. But nonetheless, it’s cheaper and more convenient than making them yourself. If you’re looking for a healthier choice of Korean fish cakes, you should check out two of my fish cake recipes. One is for side dishes and the other one is for soup making. Korean fish cake soup is also a popular Korean street snack. 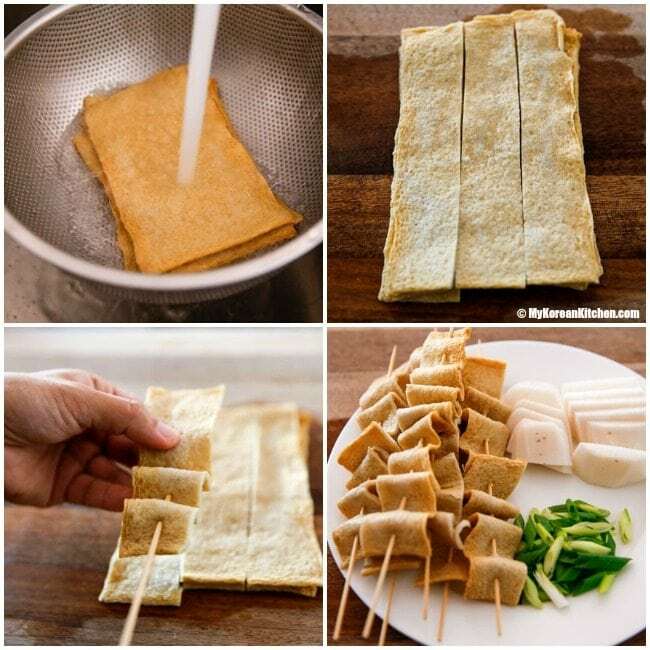 When I was a child, I used to pay 100 won (approx US $0.10) for one stick of Korean fish cake (with a cup of soup) but I heard that it’s around 1000 won (approx US $1) nowadays. When people buy Korean fish cake soup at the street vendor, they also typically order Korean spicy rice cake (Tteokbokki, 떡볶이). They go really well together, like bread and butter. My fish cake soup was really nice. Definitely good comforting food for a cold night. My broth turned out really well and it really made the soup taste refreshing, warm, comforting and tasted healthy! To make my soup more presentable, I even used a special pot that I brought from Korea 10 years ago! 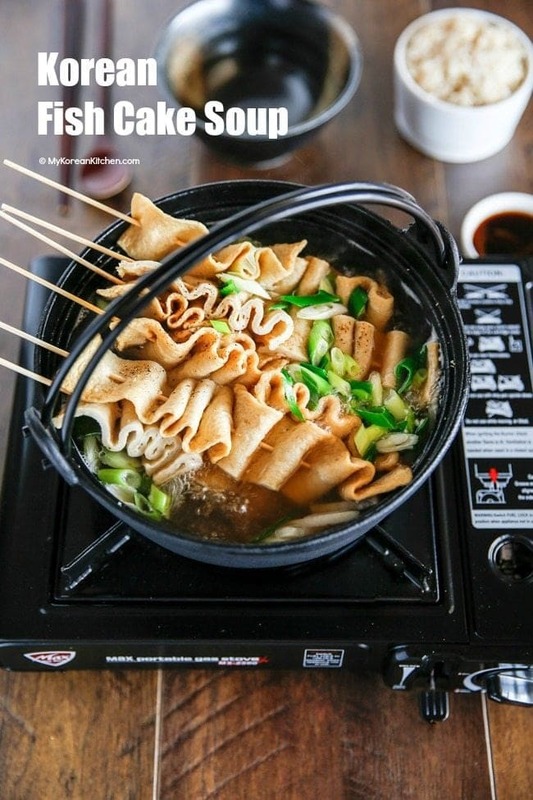 (It’s a popular Japanese hot pot.) This was actually my first time using this pot and I was quite excited about it. FYI, you don’t need to use this type of pot but it does look fancy and presents nicely! It would be great if you’re having a guest over for this type of soup. (Optional) fine sea salt to taste – I didn’t use any. 1.Put the water (6 cups) in a medium/large pot and add the dried kelp and anchovies. 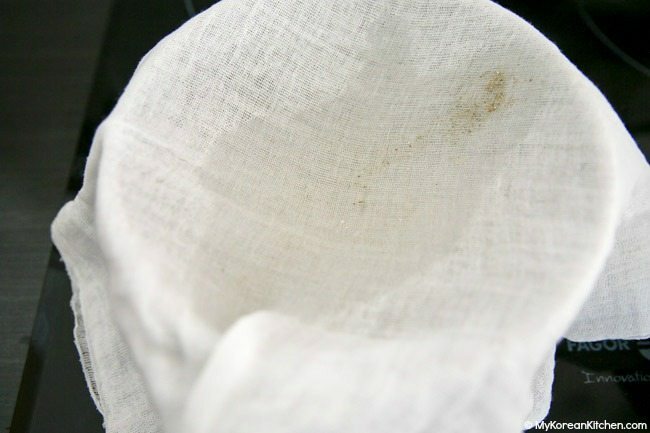 (If you can use a large tea infuser, it will be a much neater process later!) Boil it for 10 mins uncovered on medium heat. 2. Take out (& discard) the kelp and add the radish slices. Boil the radish and anchovy for a further 10 mins. 5. Boil the broth and radish (from step 3) on medium high heat and add the soy sauce, rice wine and garlic. Stir briefly. Once boiled, reduce the heat to medium. Add the fish cakes into the soup then boil until they are soft and the flavour from the soup has soaked up (about 3 to 5 mins). 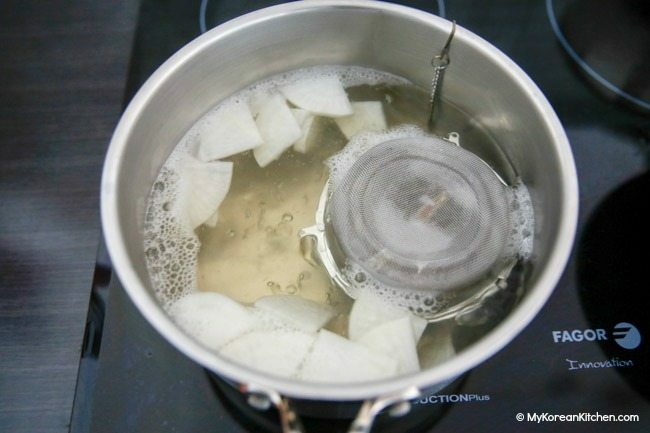 Depending on your size of pot, you may want to splash some soup over the fish cakes with your ladle to deepen the flavour. (Add some salt to taste if you require, but I didn’t add any.) Sprinkle a few cracks of ground black pepper and green onions just before serving. 6. Serve hot (with freshly cooked steamed rice and side dishes). If you can only find dried kelp or dried anchovy but not both, supplement that portion by using the other available ingredients. You may need to season with salt at the end. 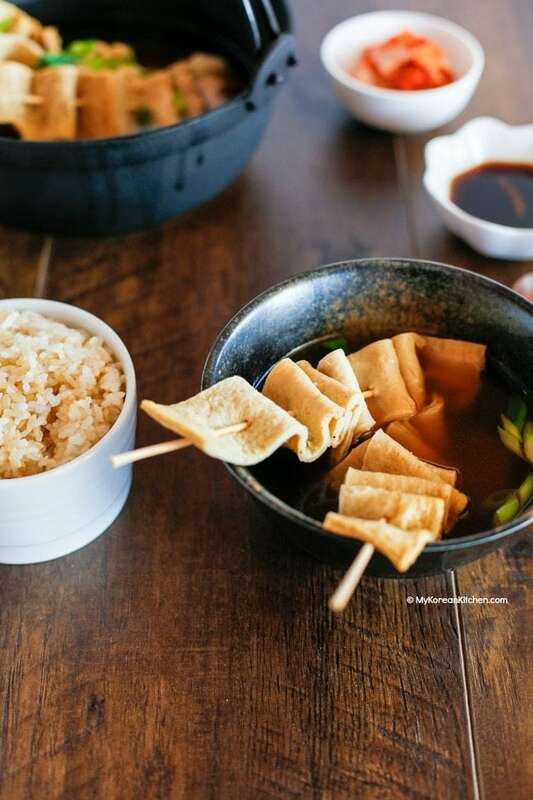 I also served with sweet, tangy, soy dipping sauce for fish cakes. You can check out my recipe from here. Update: This post was originally written in October 30th, 2006 and updated with better instructions, photos and outcome. 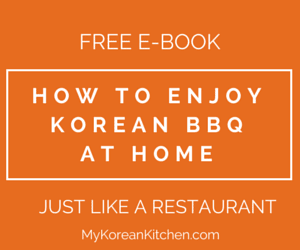 Learn how to make Korean fish cake soup! 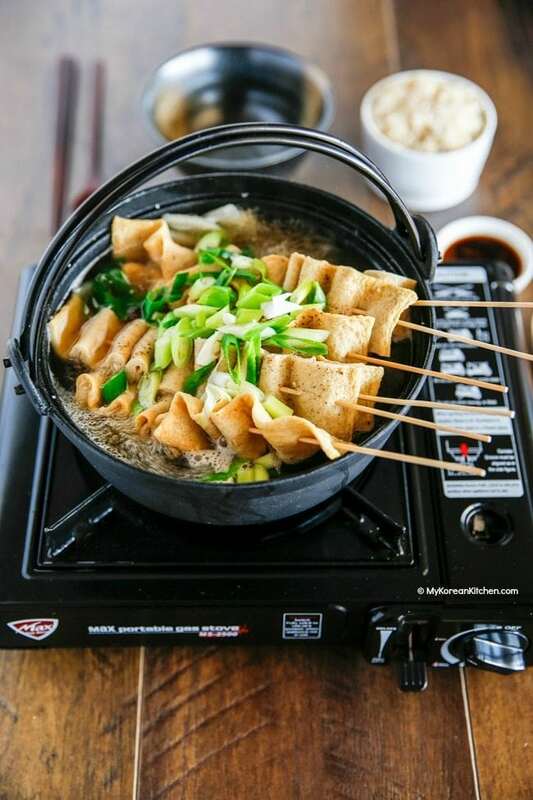 This refreshing and tasty Korean soup is one of popular Korean street food. fine sea salt to taste , optional, I didn’ use any. Put the water (6 cups) in a medium/large pot and add the dried kelp and anchovies. 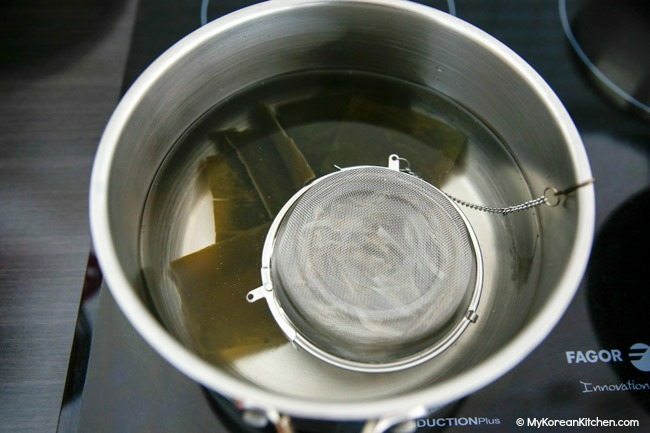 (If you can use a large tea infuser, it will be a much neater process later!) Boil it for 10 mins uncovered on medium heat. Take out (& discard) the kelp and add the radish slices. Boil the radish and anchovy for a further 10 mins. Boil the broth and radish (from step 3) on medium high heat and add the soy sauce, rice wine and garlic. Stir briefly. Once boiled, reduce the heat to medium. Add the fish cakes into the soup then boil until they are soft and the flavour from the soup has soaked up (about 3 to 5 mins). Depending on your size of pot, you may want to splash some soup over the fish cakes with your ladle to deepen the flavour. (Add some salt to taste if you require, but I didn’t add any.) Sprinkle a few cracks of ground black pepper and green onions just before serving. Serve hot (with freshly cooked steamed rice and side dishes). Hi, is there a soup base powder mix for the soup that I can just pour into the boiling water? Thanks. i have learn to your recipe. i have question, do it have a fish cake in the philippines? My Korean wife and I have been married for 37 years. I have eaten all the foods she prepares with very few exceptions. While I am adept at American and basic European foods I have not had the time over the years to learn Korean cooking. Six months ago, my wife became seriously ill. Her only lament has been she has no one close by to do her cooking for her. Even though she will eat some American food, these are not her preferred foods. No-one likes ramen constantly so when I was introduced to your web site I was elated that I might be able to provide her a taste of her own meals. Her attitude and life out look have both improved. While I can’t claim perfection she at least acknowledges my efforts. For the aid you give me providing her comfort, I truly thank you. Is there any other options for rice wine? If you can’t have rice wine, then skip it. Your Eomuk-guk looks delicious but I’m unable to get fish cake sheets here in Sarawak. We can only get frozen fish tofu cubes & fish balls from the supermarket. This soup looks wonderful! When I find a recipe I like, I use the Print icon to save it as a pdf in My Documents on my laptop. Then, when I am ready to cook, I just open the recipe on my laptop) and read it from the screen on the kitchen counter. Sometimes I print them out, if they are really detailed, and then add them to my old photo album cookbooks. I LOVE that the pictures aren’t included, though I know some people want them. There is a Japanese-American blogger, NoRecipes, whose “print” pop-up allows you to include or eliminate the photos with one little check box), so if you get people saying they want the photos, I hope you will use something like that! The person I’m intending to make this for can’t eat spring onions so would the taste be effected if I were to not use them? If so what could I use instead? Hi Kaytlin, You can skip it if you don’t want it. Spring onion releases very nice subtle flavour (which I think add value to the soup). I can’t think of anything that can be used instead! Enjoy! 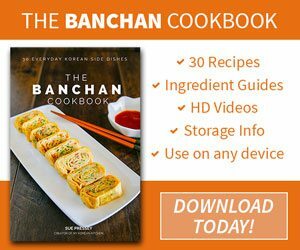 Regarding to the recipe where it says ‘refined rice wine’, what kind would be suitable or just any type? Would a normal makgeolli be fine? You can substitute refined rice wine with Korean mirim or Japanese mirin or sake. Makgeolli is definitely not suitable. 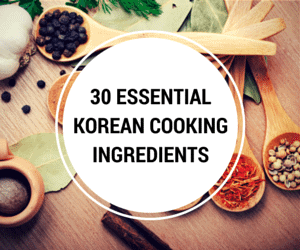 🙂 You can search for rice wine from this post (https://mykoreankitchen.com/essential-korean-cooking-ingredients/) to view the picture of the brand I use. I’ve heard that skimming the foam from the top of the soup after the radishes boil will help remove the bitterness. Mine used to be bitter before I did this. Thanks for the tip Veronica! I will do that from next time. dried kelp is not available in my country.. I’ve been searching for it but couldn’t find one..any suggestion for alternate ingredients? If you can’t find it at all, then skip it. Just add more dried anchovies. You can google and order Korean ingredients. I lost my favorite link. Good luck! Awesome! Yes, garlic and onion are great suggestions! Thank you, this is an excellent recipe. I’ve just made it. It’s one of the easiest soup dishes I’ve ever tried! 🙂 And I like the pictures too! 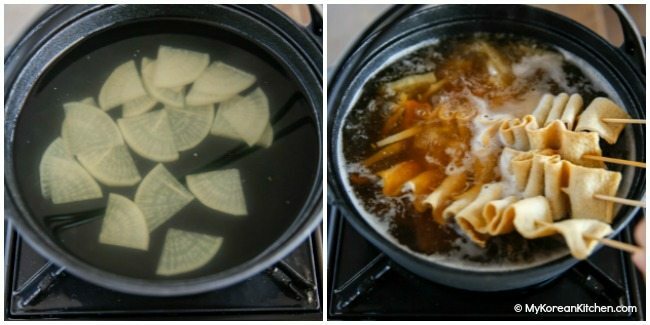 Definitely, one of the easiest soup dish to make! Glad that you liked it. Question…is Odeng healthy? I know it is processed fish parts. i eat it all the time. 🙂 To be honest, I don’t think it’s healthy! is fishcake called odeng in korean? i remember eating it as street food when i went to korea. its good 🙂 is it the same fish cake as used here? 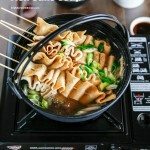 Korean is my favorite food so I’m so happy to have found your blog!